1994 Chrysler Town & Country Caravan Voyager Service Manual download now! 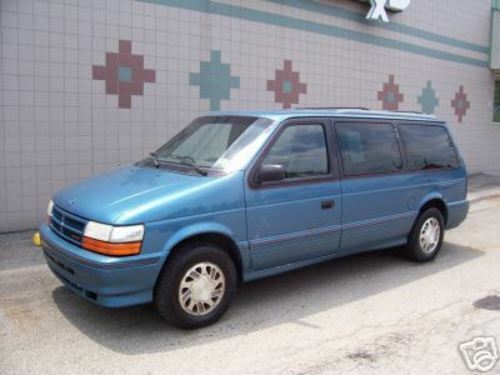 !here is a complete service/repair manual for 1994 Chrysler Town & Country Caravan Voyager. It contains detailed instructions and step by step diagrams for all workshop procedures. you only use 1994 Chrysler Town & Country Caravan Voyager Service Manuals, you can fix your cars do-it-yourself in home..
Introduction, Lubrication and Maintenance, Front Suspension and Drive Shafts, Rear Suspension and Driveline, Brakes, Manual Transaxle, Clutch, Cooling System, Electrical, Engine, Exhaust System and Intake Manifold, Frame and Bumpers, Fuel System, Steering, Transaxle, Wheels/Tires, Body, Heating and Air Conditioning, Emission Control Systems, and so on. Kohler Kd 500 Workshop Manual, Parts Manual & Owners Manual. Komatsu Pc1250-8 Machine & Engine Workshop Manuals. 3 Books.